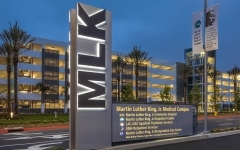 Located in the Willowbrook area of South Los Angeles, the Martin Luther King, Jr. Community Hospital Parking Structure A is a 1,430-space, six-level garage that creates an innovative blend of history and modern design. 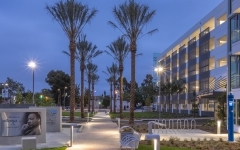 Aside from the parking structure, the project includes a newly aligned entry roadway, pedestrian walkways, and landscaping components featuring an outdoor media and gathering space. Design elements include full-height slate tile walls in the lobby areas with glass-backed elevators. 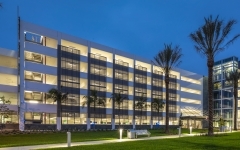 The façade design includes decorative screen panels, glass wall accents, and a cantilevered canopy identifying the main vehicular entry. 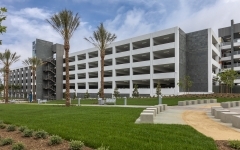 An electronic stall-counting system helps visitors find available parking stalls efficiently, and dedicated parking is available for carpool and rideshare users. Civic art elements are incorporated throughout the lawn area and a local artist was hired to create a colorful mural on the south façade of the structure facing the public street. This mural was created using metal fins of various shapes, sizes and colors, resulting in a striking amenity for the community. A historical walkway features a Martin Luther King, Jr. timeline with inspirational messages by the civil rights activist. Sustainable elements include drought-resistant vegetation, high efficiency LED lighting, low-VOC paints, use of recycled and local materials, and a storm-water filtration system. One of the major goals of the project was an emphasis on hiring local workers to construct the garage in order to maximize benefit to the community.